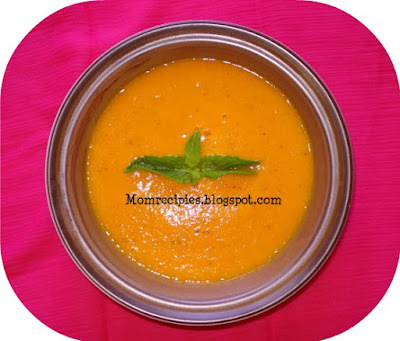 Soups are always considered to be healthy dish which should be included in our daily diet.Every spoon that goes into your mouth is full of health .This Carrot Tomato soup is rich in Vitamin A and Vitamin C.I found this soup to be more nutritious, healthy as well as tasty. Its Sweet and tangy taste makes it more delicious for kids..Kids will definitely Love it.It is good for infants and toddlers also. Cut carrots and tomatoes into big pieces. Cook them with one cup of water in pressure cooker or microwave until they are completely cooked. Cool and blend in a blender to a smooth paste.Strain it to remove tomato seeds . 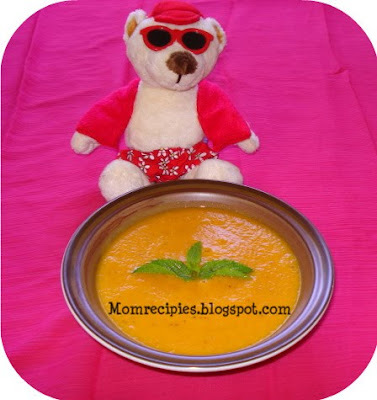 (I dont strain the soup, because I feel straining will remove all the fibers from the soup). Bring the mixture to boil adding 2 cups of vegetable stock. Add salt ,sugar and pepper.Simmer for two minutes. Serve hot garnished with butter or cream. Looks so thinck and delcious. Love the pic.